Alberta Premier Rachel Notley is fuming over the Trans Mountain pipeline ruling. Alberta Premier Rachel Notley and Prime Minister Justin Trudeau meet in his Parliament Hilloffice on Parliament Hill on Nov. 29, 2016. Prime Minister Justin Trudeau has downplayed the dramatic decision by Alberta's premier to abandon his national climate plan, pointing out that the province is already doing what he wants. Speaking in Oshawa, Ont. 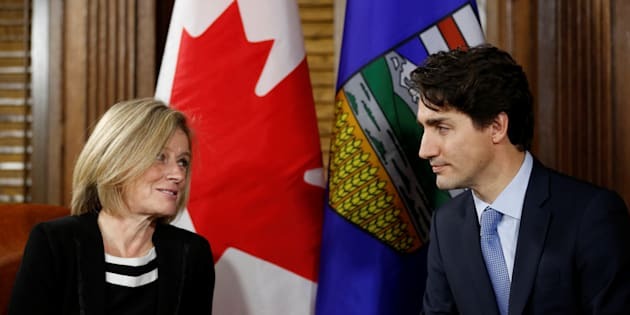 Friday, Trudeau was asked about Rachel Notley's announcement the night earlier that Alberta will not go along with the federal plan after Ottawa's approval of the Trans Mountain pipeline expansion was overturned the Federal Court of Appeal. Notley called on the Trudeau government to fight the issue at the Supreme Court and recall Parliament to give what she called a "crisis" the attention it deserves. "The current state of affairs in Canada right now is such that building a pipeline to tidewater is practically impossible," she said. The federal plan demands provinces and territories put a price on carbon emissions — be it through a cap-and-trade program or carbon tax — that will start at $20 per tonne in 2019 and rise by $10 a year to $50 a tone by 2022. Those jurisdictions without a suitable plan will have a carbon tax imposed on them, with feds promising to return revenue directly to residents. Alberta's current climate plan already includes a price on carbon of $30 per tonne. Exiting the federal plan would mean, however, that the price doesn't jump to $50 per tonne by 2022. Trudeau told reporters that while it would be "ideal" for provinces to comply, "if there are provinces that don't want to participate in this climate change plan, the federal government will do it alone." He suggested he wasn't worried about what Alberta's move might mean for his government's approach to fighting climate change. "Their own plan on climate change will continue to be in place and is equivalent to the targets set by the federal government, at least for the next few years," he said. The prime minister reiterated his government will go forward on purchasing the Trans Mountain pipeline and expansion assets in order to get oil to other markets than the United States. "With everything that has been going on, people can kind of understand that having only the United States as a market for 99 per cent of our oil resources simply doesn't make sense anymore," he said. The prime minister added that he spoke with Notley Thursday and knows she is "firm" in her support of balancing economic growth with protecting the environment. Notley's chief opponent in Alberta, United Conservative Leader Jason Kenney, has mocked the notion that the NDP government is playing "hardball" with Trudeau by keeping the provincial carbon tax in place. Alberta NDP playing 'hardball' with Justin Trudeau: Keeping their $30/tonne carbon tax when Trudeau is demanding a $10/tonne carbon tax in 2019. And no pipeline. Notley's decision is significant, however, because governments in Saskatchewan and Ontario are fighting Trudeau's carbon plan in court. The debate over a carbon tax is also shaping up to be a critical issue in the New Brunswick provincial election. N.B. Tory Leader Blaine Higgs calls the September vote a "referendum on the carbon tax." Federal Tories plan to run aggressively against the plan in next year's federal election. At the Conservative policy convention in Halifax last weekend, Tory Leader Andrew Scheer pledged that his first act as prime minister would be "to get rid of the carbon tax once and for all."